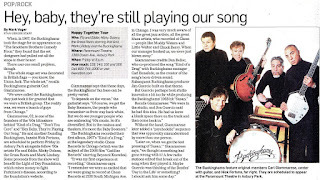 Believe it or not, one of the hottest concert tickets out there right now is for the "Happy Together Again" tour featuring The Buckinghams, Rob Grill and the Grass Roots, Micky Dolenz of The Monkees, Mark Lindsay (former lead singer of Paul Revere and the Raiders) and Flo and Eddie (aka The Turtles). They've been playing to sold out theaters all over the country ... in fact, tonight they'll be appearing at The Paramount Theater in Asbury Park, New Jersey. I was able to ask a couple of the performers about how the tour was going so far ... we've heard nothing but positive response from our readers ... unfortunately, they're not passing through Chicago this time around ... but there are still plenty of dates left, giving our readers a great opportunity to see some '60's music legends live in concert. The Happy Together 25th anniversary tour has been fabulous! Sellout shows! The show has been so well received. We have played to packed houses and that's fabulous considering they are big venues ... outdoor amphitheatres along with some very nice old theatres, too, like the Fox in St.Louis. It's an experience Nick and I haven't had in a long time traveling on a tour bus. Try sleeping, ha ha. I must say it is a very well run tour. I think everyone on the tour is performing their hits with authenticity, but what's really great to see is the wonderful audience response. It's so much more than just performing the songs. It's the way we relate to our fans and bringing back the experience of the late 60's. Nick and I had the opportunity to travel one day with Mark Volman and Howard Kaylan by car. What would you think those zany guys listen to on the car CD player? Hendrix? Zappa? NO, Frank Sinatra, yes Sinatra. It has been a pleasure getting to know Mark Lindsay and Micky Dolenz, too ... what great, talented people they are. I can give you an update again later on. Things are really wonderful out here this summer for the Happy Together Tour's 25th Anniversary Celebration. We've got Mickey Dolenz out with the Turtles this year as well as Mark Lindsay, The Grass Roots and the Buckinghams ... Wonderful crowds, beautiful theaters, and -- as long as we can keep the rain away -- the best summer tour ever! We just left the midwest and are now in Connecticut. Tonight we make our way to Asbury Park, where I'm absolutely certain the the ghost of Bruce Springsteen will be joining us onstage ... probably looking a lot like Mark Volman ... in a now-famous purple jacket! Then it's Westbury for our annual visit. We actually take a break for a few weeks afterwards and resume mid-July to start up again back in the Northeast and ending up in Florida where all good tours reach their conclusion. If you're sixties music fans, or just want to turn your children on to the great hits that you experienced while growing up, I guarantee you'll get a lot of bang for your buck out here with us this summer. I'll report again in a couple of weeks as our second leg begins. We also received a couple of concert reviews from two of our readers who caught the current "Happy Together Again" tour in Omaha this past week. Last night we went and saw the "Happy Together Tour", 25th Anniversary in Omaha. I had made it to the first tour back in 1985, which featured several of the groups that played last night also. Last night's show had two of the founding members of the Buckinghams, Mark Lindsay, Rob Grill of the Grass Roots, Micky Dolenz, and finally Flo & Eddie of the Turtles. Over all it was a pretty decent show with good backing bands helping these artists with the 60's sound. The Buckinghams sounded better than great, like right off the original 45's. Nice touch also is that they did several other songs from the Soul Survivors and Brooklyn Bridge perfectly. Top performance in both my wife's and my eyes was by Mark Lindsay. He still can sing and move great for a 68 yr old. Low point of the show was by Rob Grill. Wasn't aware he was suffering from some sort of physical problem. He really never did sing, but more so shouted out the words to the songs as the music played. He never left a chair the entire performance and was helped on and off the stage. Micky Dolenz did acceptable job. I've never felt he was the greatest singer in the world to start with and the Monkees benefited from some great songs by some great song writers to boost their popularity along with a TV show, which didn't hurt at the time. Flo & Eddie (The Turtles) were good but I felt they were lacking a bit. Songs sung were almost secondary to the banter they felt they had to do. I would gladly play the full price of tickets to just have seen both the Buckinghams and Mark Lindsay full shows. I would say catch the show if in your area. The Buckinghams: Rating: Good ... Performed their 67-68 hits plus a nice rendition of "The Worst That Could Happen". Definitely got the crowd involved starting with "Don't You Care", getting the crowd chanting "I Love You, Yes I Do, I Do." during "Susan". Finisher was "Kind of a Drag" and they really rocked it out to the end. Mark Lindsay of Paul Revere and The Raiders: Rating: Excellent ... Mark came out with a bright shirt and sunglasses ready to rock! He opened with a medley of "Too Much Talk" and "Just Like Me". He rocked to "Louie, Louie" before hitting his only solo effort with a terrific rendition of "Arizona". I loved it, but couldn't help but wish he would've done "Silver Bird" and "Been Too Long on The Road". Next was "Indian Reservation", which was really missing something without any strings. It was still great to hear him sing it live. He bounced on into "Hungry" and a rocked out version of "Good Thing" with some super guitar work by the band. He talked about dressing in the ruffled shirt and tri-pointed hats and a video was shown in the background which was fun to see. Mark finished telling us how much he loved the 60s and then one day he woke up and found himself in the 60s again! (age), but he was still loving to get his "Kicks". Mark was someone I've always wanted to see and he didn't disappoint me. For my money, he made the concert. The Grass Roots featuring Rob Grill: Rating: Fair ... Well, Mark Lindsay was a tough act to follow and Rob Grill certainly wasn't up to it. I'm certainly glad I saw the Grass Roots twice before so I could remember better days for Rob. He has apparently has had four hip replacement surgeries and deals with a lot of pain, so he was seated on a stool for the entire gig. Lead Guitarist Dusty Hanvey provided ample support and stepped up when needed with excellent vocals.Rob started with "Heaven Knows" and his choices included "Let's Live For Today"; "Sooner or Later"; "Temptation Eyes"; "I'd Wait A Million Years"; and finished with "Midnight Confessions". He seemed in a hurry to finish and was glad when it was over. A 15 minute break followed. Micky Dolenz of The Monkees: Rating: Very Good ... Dolenz started with "That Was Then, This is Now" -- not one of my favorites. He handled "Pleasant Valley Sunday"; "A Little Bit Me, A Little Bit You"; and "Last Train To Clarksville" with ease. Next he talked about how great it was for them to play with Jimi Hendrix who opened for their first tour. Micky did a terrific rendition of "Purple Haze" with some outstanding guitar work. He stopped in the middle of the song to explain how Hendrix had to put up with Monkee fans yelling "We want Davy!" chants after every song! Given how big Hendrix music has become, it seems so ridiculous today. I was hoping he would move into one of the more psychedelic hits like "Words" or "Take A Giant Step", but instead he moved on to a rockin' rendition of "I'm Not Your Steppin' Stone". About five bars into the song, Mark Lindsay stormed onto the stage to stop the music, charging Dolenz with stealing the Raiders song. Dolenz admited it was true and invited Lindsay to join him in playing "The Monkees Hit" song! Mark grabbed a tambourine and the two of them did an awesome job sharing their "hit". Dolenz fumbled around, admitting Davy Jones sang the lead on "Daydream Believer". Dolenz gave ample credit deservedly to the many excellent songwriters that made the Monkees songs great. He finished by telling the "kids" in the audience that he did the following song before any had ever heard of Shrek! A nice rounded out production of "I'm A Believer" followed. As expected Micky was very entertaining and a lot of fun! The Turtles: Rating: Very Good ... These guys are clearly young at heart. Opening with "You Baby", the crowd was immediately involved in the singing. Lots of showmanship followed with hits mixed in: "She'd Rather Be With Me"; "It Ain't Me, Babe"; "Elenore" and "You Showed Me". The guys did a fun parody of Bruce Springsteen, making fun of his poor choice of words and incoherent ramblings at concerts and in his songs. They also had some fun with Doors songs, played with skill by the band and there was even a little Iron Butterfly mixed in. Unfortunately they left out "She's My Girl" or they would've gotten an excellent rating. The Turtles still sound great. The concert finished with "Happy Together" and there was a CD signing session by the artists. Overall: Very Good ... The place was a great concert venue with excellent acoustics, but many upper seats were unsold with tickets at $35 and $45 on the main floor. It's a good time, but keep your expectations reasonable if you go. Carl and Nick from the Buckinghams absolutely rocked at the Dodge Theater in Phoenix as part of the new Happy Together tour. They clearly had the best vocals and polished performance. Nice job, too, by Mark Lindsay, Micky Dolenz and the Turtles. The meet and greet line after the concert was LONG! Looking forward to seeing the Bucks again soon! I was VERY pleased with what I saw at The Happy Together Tour this year - what a lineup! Biggest surprise of all? Mark Lindsay - he literally stole the show. (Having seen Mark perform as part of a similar bill a few years back I can only tell you that this is a complete turn-around from that performance where he came out, sang four songs and looked as though he couldn't wait to get off the stage!) All of the acts were good - lots of energy for a group of performers who came from the '60's ... and are now IN their '60's!!! Highly recommended to all oldies fans everywhere - if this show is coming to a theater anywhere near you, check it out - you will not be disappointed. I did like the overall show of the Happy Together, Mark Lindsey is what carried it. Though I was not Happy when I did not see the Buckinghams as a Band. Carl and Nick did a good job, but I was expecting to see and hear the well rounded sound and antics of the band. Is this gong to be the norm? I hope the band we know isnt really gone and that this is just a "Happy" thing. For the record, the band is still intact and has several more concert appearances coming up this year with the full band members on board. (The Buckinghams recently changed drummers after Tom Scheckel, a 27-year Buckinghams veteran joined Paul Revere and the Raiders ... the version WITHOUT Mark Lindsay ... down in Branson.) The rest of the band remains intact. A special all-purpose back-up band was put together for The Happy Together Tour, allowing the pace of the show to move a little quicker ... now the singers just come out and join the band when performing their hits. With Carl and Nick being the two remaining original members of The Bucks, the decision was made to have these two perform this series of dates. It's Our Annual "Third Of June" / Bobbie Gentry Tribute! Another year has come and gone ... since we last talked about "Billie Joe". We've saluted Bobbie Gentry's MONSTER #1 Hit several times now over the past few years on the anniversary of the date that Billie Joe McAllister jumped off the Tallahatchee Bridge. Once again, we've tried to track Bobbie down without success ... word is she's become quite a recluse over the past couple of decades ... too bad because we'd LOVE to hear from her! Last year her appearance on The Smothers Brothers Comedy Hour was released on DVD Home Video ... it's a classic interpretation of her hit tune. >>>There's more Ode to Billie Joe theories than there are about the JFK assassination. Gentry had ANOTHER Top 40 Hit in 1970 with "Fancy", a song later covered with great country chart success by Reba McEntire ... but you rarely get to hear the Bobbie Gentry original version on the radio anymore. Yep, I remember .. here in Chicago I was out bailing cotton and my sister was bailing hay. If I remember right, 44 years ago today was just another sleepy delta day. I knew there was another adjective that went in there but couldn't think of anything but sh***y! 44 years ... and I STILL hate that song! OH MY .............. I hadn't heard because I WAS OUT CHOPPIN' COTTON AND MY BROTHER WAS BALING HAY!!!! I'd help you celebrate ... but I'm too busy passing the biscuits. I am constantly on the look out for concerts by our favorite oldies artists, especially in the Chicagoland area, summer fests, shows, etc. I'm not sure how difficult it would be but is it possible to run an announcement column listing upcoming shows on your emails? I figure if anyone would know who was performing where it would be you and your close contacts. Just a thought. Have a Great holiday weekend. Thanks. What a show and what a BAND! Can't wait to see them for their final performance EVER at Copper Mountain Sept 5th! 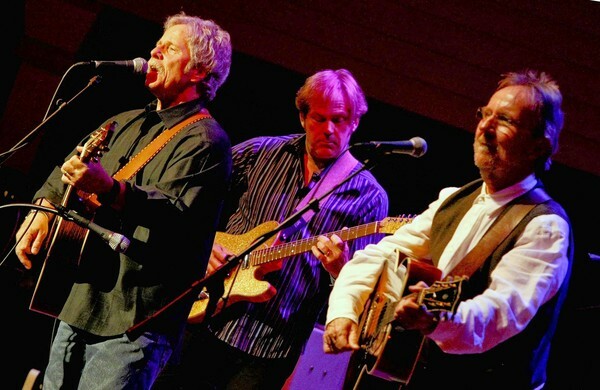 The veteran of the Byrds and Flying Burrito Brothers reunites with Herb Pedersen and other partners for a labor of love. 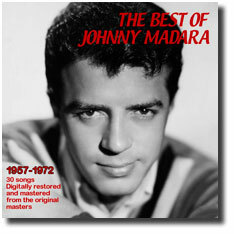 That Philly Sound is proud to announce that our newest CD, THE BEST OF JOHNNY MADARA, has just been released and is available to purchase through CD Baby. This rare, historical CD is a retrospective of Johnny Madara's career as a performer, including 30 songs, 4 of which have never been released, with over 40 historical photos of his 50 years in the music business. Please go to THAT PHILLY SOUND to purchase other rare Philly CDs, and learn more about the artists and people behind the scenes that made up "The Sound of Philadelphia." THAT PHILLY SOUND is presented by songwriter / record producer, John Madara, who co-wrote and co- produced such timeless classics as AT THE HOP (Danny and The Juniors), THE FLY (Chubby Checker), 1-2-3 (Len Barry, who also co- wrote the song) and YOU DON'T OWN ME (Leslie Gore). John also produced the huge hit record, ROCK AND ROLL IS HERE TO STAY (Danny and The Juniors). All songs have been digitally restored and digitally mastered. Thanks for your support! 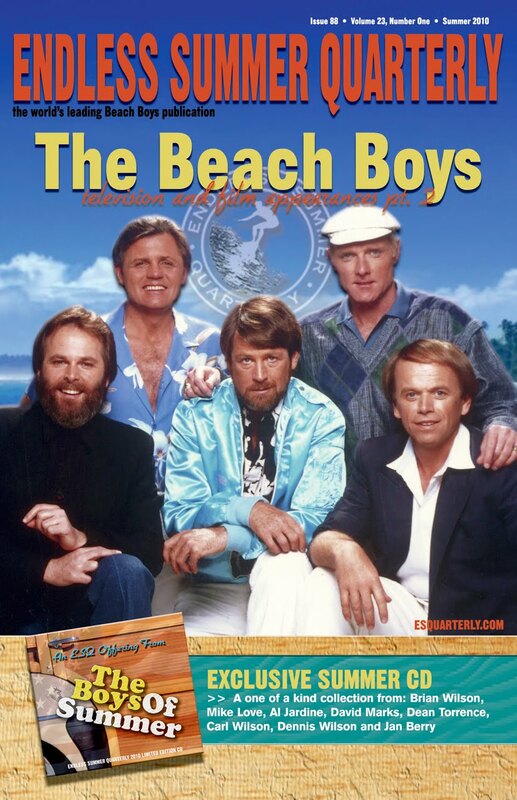 SUMMER 2010 - Endless Summer Quarterly, featuring: The new CD compilation and "The Beach Boys TV & Film Appearances PT. 2"
The Summer 2010 edition of ESQ features a new compilation that gathers together music from: Brian Wilson, Mike Love, Al Jardine, David Marks, Dean Torrence, Carl Wilson, Dennis Wilson and Jan Berry in one collection for the first time ever! My band, REBOOT has finally got our audio demo posted on our website. There are nine songs (Most are only a portion of a song). I hope your computer has good speakers, so you get the full sound. Click on "Audio Demo." Please let me know what you think of our demo and leave a message on the website's "guest book" page. I was a small bit saddened that I had to scroll several pages before seeing a mention of Memorial Day. That's OK but always remember without the sacrifices of those great Americans perhaps the 50's would have been much different. Here's one of my Favorite songs about America. Happy Memorial Day. How ya' doin'? I don't have to elaborate on how boring this season of "American Idol" has been. The only thing that is interesting about the show is "Who's going to replace Simon Cowell"
(For the record, if nominated, I will not run ... and if elected, I will not serve! kk)Two weeks ago, comedian / actor / singer Jaime Foxx may as well have disqualified himself as a possible replacement for Simon Cowell on “American Idol”. As a mentor to the contestants on Tuesday and as a comment maker on the Wednesday results show, he was too strident, overbearing, and “in your face” to be welcomed into my home every week. A month ago I asked my readers “Who do you think will replace Simon Cowell, Ron Fair (CEO of Geffen Records) or Indie Producer / manager Joel Diamond?" You can read over comments, at the bottom of the article, made by some of the biggest names in the industry. They make it absolutely clear who the next judge should be! With the season now officially over, I found myself looking forward to the finale more from the aspect of seeing just how emotional saying goodbye might be for Simon than actually caring which of the two finalists won. (How sad is that ... but to call this a lackluster season ... ESPECIALLY after all the excitement generated last season by Adam Lambert ... is a given.) In fact, we ended up missing the big finale show ... although I did tape it so that I could roll back the last five minutes to see the winner crowned. We may eventually watch the whole thing ... but only because the "guest list" sounds extraordinary. I honestly believe that most of the top ten finalists never would have gotten that far in any other season ... and I fully expect Simon to ultimately announce that he waited too long to leave ... had he headed out the door after the previous season and the Adam / Kris showdown, it would have been far more climatic ... and he easily could have said "I don't think we'll ever top this ... so I'm going out while the show is still on top." This morning my good friend producer / manager Joel Diamond, who is under consideration to replace Simon Cowell, gave me a first hand account of what happened last night at the “AMERICAN IDOL” finale. Joel says, “Last night my 17 year old daughter Briana and I had great seats at the Nokia Theater in Hollywood, for the season finale of “AMERICAN IDOL” and it sure did not disappoint! In the closest race of the 9 seasons of the show, with only 2% of the vote separating Crystal Bowerstock and Lee DeWyze, Lee deservedly walked away with the crown. How moving was the tribute to Simon Cowell, who seemed to genuinely enjoy all the roasting, kudos, and accolades from everybody, including former judge Paula Abdul who looked absolutely gorgeous when the curtain rose on her. 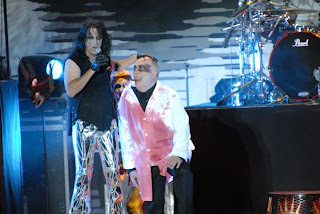 There were spectacular guest performances by Alice Cooper, Christina Aguilera, Bee Gees, Chicago, Janet Jackson, Michael McDonald, and Alanis Morrisette, which included duets with members of the final top ten and certainly what seemed to be almost straight from his hospital bed, the surprise appearance of Brett Michaels, which brought everybody to their feet. Another highlight of the evening for me was the former winners, runners up, and exceptional past contestants all coming out dressed in white, which dazzled the crowd with their moving Simon Cowell tribute. Artie, I’ve been to Academy Awards, Emmy’s, Grammy’s, etc., but I’ve never seen the excitement that I saw last night at the Nokia Theater. It was total pandemonium both inside and outside the theater. I would give anything to have a shot at producing just one track with either Crystal or Lee! Having said that, I’m now in the process of recording a new CD with the JOEL DIAMOND EXPERIENCE, which will feature duets by both veteran artists as well as new and underexposed artists. The first single from the album, UNITED WE STAND (2010) featuring BENNY MARDONES (who wrote and was the artist on “Into The Night” which will also be Usher’s next single) and Teresa James, was just rush released yesterday. 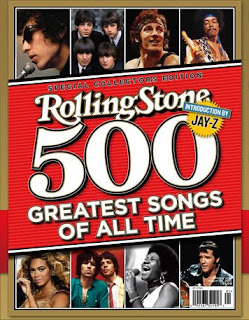 Am I HIGH on dope or didn't Rolling Stone announce the 500 Biggest Records of All-Time like 3 or 4 years ago? (SAME LIST). Are they running out of new ideas and material or what? Hello??? I think this is the third time they've come up with this list ... slightly different each time as things change I guess. (Must be if Jay-Z has written the intro this time around!) Like an idiot, I bought a copy ... just HAD to see the list. 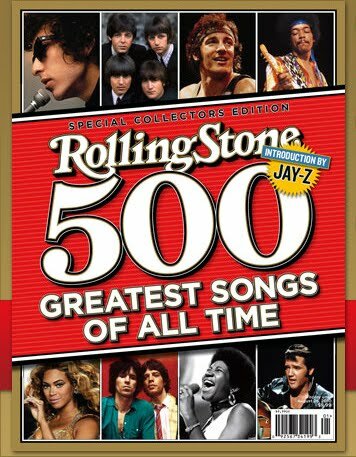 Already lots of press about this ... 23 Beatles tunes featured, 14 by The Rolling Stones ... and Dylan back on top with "Like A Rolling Stone". This is one, as they say, you just gotta see! The pieces below explain it but to encapsulate: Good Morning America ran a "Live Your Dream" contest and Mark Wilkins, the self-described "Pudgy Pastor" from Crown Point, Indiana, won a chance to rock out on stage with Alice Cooper. 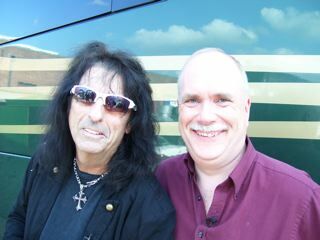 It happened last week in Charlotte and will be aired this Thursday morning so tune in or TiVo Good Morning America to see an amazing piece about a dream come true or -- more appropriately since this is about Alice Cooper -- a nightmare come true. We've pasted some photos below that were taken by Jane Wilkins, Mark's wife, so you can see the transformation. CLICK HERE to see Mark's submission video. Big dreams are all about getting out of your normal routine -- and Mark Wilkins wants to go way, way out. Mark, the self-proclaimed "pudgy pastor" from Crown Point, Indiana, wishes to fulfill his lifelong dream to rock out with '80s metal legend Alice Cooper. This year Mark turns 50, but he has never given up on the dream he had as a boy in his room listening to Alice Cooper records in the '70s while the other kids idolized Joe Montana or Lee Majors. He has every Alice Cooper album and song on his iPod and this summer he will be taking his wife and 21-year-old daughter to their first Alice Cooper concert, his fifth. "I am a father, a husband and a pastor and I love all those," Mark wrote us. "But being on stage at an Alice Cooper concert would be so out of my life box it would mean the WORLD to me." In a video submission, Mark's co-workers at Crown Point Methodist Church enthusiastically supported his bid to have his dream come true, joking that at least it would get him out of the office for a few days. At least we think they were joking. JOHN J. WATKINS THE TIMES - Pastor Mark Wilkins celebrates Monday after he finds out he is a winner of the Living the Dream Contest on ABC-TV's "Good Morning America." 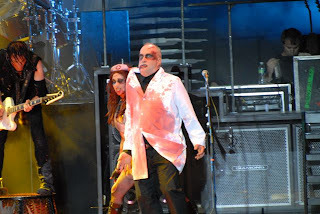 Wilkins will get to rock with legendary rocker Alice Cooper. CROWN POINT Mark Wilkins screamed like a schoolgirl, just as he predicted. "Unbelievable," he yelled pumping his fists into the air. A finalist for the Living the Dream Contest on ABC-TV's "Good Morning America," Wilkins, 49, the senior pastor of First United Methodist Church in Crown Point, has dreamed of being on stage with legendary rocker Alice Cooper since he was a little boy. Monday morning, the show's anchors announced that Wilkins, and the contest's three other finalists, will all have their dreams come true. For Wilkins it will happen this week. Late Monday, he received word he will fly to Charlotte, N.C., tonight to appear with the rock star at his concert Wednesday, according to an e-mail from the church. Wilkins hadn't slept well lately, and at 6 a.m., he was bouncing his leg with nervous energy as he unlocked the church for the members of the congregation who were gathering to hear if he won the contest. "This is so unreal to me," he said. After the on-air announcement Thursday of his finalist status, word spread quickly to vote for Wilkins' dream. A friend, whose son is stationed in Afghanistan, got his entire platoon to vote for Wilkins. And a pastor's blog with an e-mail list of 15,000 sent out the message. Shortly before 7 a.m. well-wishers started to gather in the library of the church, some wearing shirts that had images of both Alice Cooper and Wilkins. Bonnie Meyers, the church's director of outreach, put tissues and a bottle of sparkling cider on the table by Wilkins. "This is in case you lose," she said gesturing to the tissues, then gestured toward the bottle. "And this is in case you win." Wilkin's daughter Abigail, 21, took all the excitement in stride. Her father played Alice Cooper's "School's Out" for her on the last day of school for her every year growing up. There's nothing he could do now to shock her, she said. Before the announcement, Wilkins addressed the group, thanking his friends and family for coming to be with him to hear the news. "Boss, are you nervous?" Meyer shouted. "I'm gonna puke," Wilkins responded. But he didn't. Instead, after hearing the news he cheered and kissed his wife. anniversary. "It's a huge relief," Wilkins said. Sometimes I am surprised at the songs or records I find on youtube that people have put on. Years ago I came up with this question that was even hard for me to answer. The question was, If you were stranded on an island, couldn't get anywhere, had electricity, had a record player, what would be the 3 records you would want to have that you obviously would play over and over again? Call it The Tragical History Tour. Here in New York, residents of the famed Dakota building are battling back against an invasion of tour buses packed with passengers straining to catch a glimpse of the site where John Lennon was slain. Thirty years after the Beatles star was gunned down outside the building where he lived, the site still draws curiosity seekers. And with them come noisy, gas-guzzling, pollution-spewing, traffic-snarling buses, many from as far away as Canada. When the tourists get out, they block the entire sidewalk and you can't get back into your building. It's dangerous because many times the buses block the intersection. They block the vision of the pedestrian walking across. Gale Brewer, the city councilwoman who represents the area, asked Mayor Bloomberg last week to station enforcement agents outside the Dakota on weekends to keep buses from double parking. Not long after Brewer weighed in on the issue, a bus driver double-parked beside the building on West 72nd Street and Central Park West and let passengers off. "I'm sorry", the bus driver said when confronted. "We only park here for ten minutes." I can understand how it is a problem and why residents are annoyed. I wouldn't like it where i live. Hey, Kent ... Hope things are well on your end of the monitor. You probably knew this already and have had discussions on your website about it, but I just read that the Beatles Capitol Albums Volume 2 contains incorrect mono versions of 'Beatles VI' and 'Rubber Soul'. I had no idea! The sticker on the box after the serial number has "SK1" which they say is the correct copy. Knowing this, I'll be looking to find the right version. Also, as we had talked about in the past, it would be nice if they released a third volume of the Capitol albums, although, from my research, it looks as though the only real gems we're missing as far as the basic U.S. LP catalog is concerned (and by that I mean their 1964-1970 output) are the United Artists version of 'A Hard Day's Night' and 'Yesterday And Today'. While it would be great having official copies of 'Hollywood Bowl' and 'Rarities,' my friend Steve (whom you know) recorded them for me from vinyl. He also recorded for me 'Historic Sessions'. Anyway, I'm kind of bummed up at having to buy Volume 2 of the American albums again, but ... it is what it is. I hadn't heard anything about this ... but I know when the CDs first came out, MY copy had the "false start" beginning of "I'm Looking Through You" ... which was REALLY ironic because my original vinyl version had the same thing. Having bought this LP in 1966 shortly after it was first released, it was probably 20 years later before I found out that this wasn't the way "I'm Looking Through You" was supposed to start! The intro was staggered so perfectly that I just assumed it was INTENDED to be that way ... and had never heard it played in any other fashion! In that I tend to buy ALL of my Beatles stuff on the first day of release, odds are I've got the wrong mono-mixes, too ... although I'm not quite sure what that means. What exactly IS the "wrong mono mix"??? As for "A Hard Day's Night", I don't know if that one would have EVER been included since it was released on United Artists (but I know for a while there UA and Capitol were under the same umbrella ... not sure if they still are or not.) Regardless, it seems like this would be a PERFECT "stand-alone" release if only because of its landmark status as both a soundtrack and a film. Having all the incidental instrumentals intact would be a real bonus. (And let's face it, "Ringo's Theme" was actually released as a single here, too ... yet has been unavailable legitimately ever since!) I've been campaigning for an official release of this album on CD for quite some time ... we fans certainly deserve it! Of course, you just never know with The Beatles' stuff ... how many times are people going to be willing to buy and re-buy the same stuff ... it'll be interesting to see what other releases come down the pike. So you don't have the correct mono mixes of 'Beatles VI' and 'Rubber Soul' on CD, either? As for "I'm Looking Through You," the way I understand it is that the stereo version has the false start but the authentic mono mix does not. I'd love to get the correct versions but I don't find myself obsessed with getting them. That's probably because we own the mono box of their British albums, which to me is more important. However, could you ask around here and there? A burned copy of both 'Beatles VI' and 'Rubber Soul' in real mono would more than suffice. As far as I know, everything on the 'Hey Jude' compilation is commercially available as it was released in stereo and all of the stereo versions have been officially released. In other words, the stereo tracks on 'Hey Jude' have nothing exclusive about them so technically I can burn my own copy of 'Hey Jude' from the British stereo albums and 'Past Masters'. I read an interesting fact the other day that I wasn't aware of. Almost everybody knows that George Harrison was the first former Beatle to have a solo #1 Hit when "My Sweet Lord" hit the top of the charts in December of 1970 ... a surprise in its own right based on the long-standing attention devoted to the Lennon - McCartney songwriting team ... but did you release that he was also the LAST former Beatle to accomplish this feat??? "Got My Mind Set On You" reached #1 in January of 1988 ... and NO Beatle has reached the #1 Spot since ... in fact, there hasn't even been another Top Ten Hit by a former Beatle since Harrison scored his #1 record! I didn't realize that about George Harrison having the final #1 solo hit of all the Beatles. Most people are unaware that James Ray cut the original "Got My Mind Set On You" in the early '60's. I met Art and President Reagan at Disneyland's 35th Anniversary many years ago. Art is a great guy and a great broadcaster. I knew he was getting old and God Bless his soul. Thanks for including the Art Linkletter track. That one sure chokes me up nowadays in a way it didn't 40 years ago. Art was truly an American icon. Special thoughts today, and every day, for parents everywhere who have lost a child - in whatever circumstance. With the passing of Dennis Hopper, I think we all had a little part of us die along with him, for he will always be remembered as "Billy" in the Academy Award Winning movie "Easy Rider". I have a GREAT story to share that was related to me by Byrds founder and creater Roger McGuinn. Roger told me back in '76 in an interview for a Byrds Special that I was putting together that in 1968 he teamed up with two of his friends, Peter Fonda and Dennis Hopper to help create and write part of the soundtrack for the movie "Easy Rider". Here's the cool thing ... the Academy Award Winning Movie was actually BASED on the personalities of Roger McGuinn and David Crosby of The Byrds! McGuinn being "Captain America" (Peter Fonda) "Everything will work out okay" and Crosby as "Billy" (Dennis Hopper) "Oh man, everything is the worst, nothing will work out". Apparently Peter was a little on the cheap side and put on most of his record collection as the soundtrack, including the Byrd's "Wasn't Born To Follow". McGuinn performed two songs on the musical soundtrack himself, "It's Alright Ma, I'm Only Bleeding" and "The Ballad of Easy Rider", the latter being the title track from the movie composed by McGuinn. Here's the great thing ... before the movie was released, Fonda traveled to New York and hooked up with Bob Dylan and said "Hey man, I need an ending song for this movie", showed Bob the film as it was then, and later in a restaurant Bob scrawled on a napkin: "The river flows, it flows to the sea, wherever that river goes that's where I want to be". He then handed the napkin to Fonda and said "Give this to McGuinn ... he'll finish it" and the rest is history. As you remember, that was the ending tune at the finale of the movie. Roger still performs it to this day live in concert. Who would have ever thunk it? McGuinn and Crosby as the basis for "Captain America" and "Billy" in "Easy Rider"??? As Paul Harvey would say, "And now you KNOW the REST of the STORY"!!! God Bless Dennis Hopper ... what an incredible actor!!! After reading your piece on Rick Nelson and the reaction from the crowd at Madison Square Garden, thus inspiring his big hit record 'Garden Party', I just wanted to say that I was there when John Sebastian practically got booed off the stage because he only wanted to play new songs that nobody had heard of and the audience wanted to hear the old Lovin' Spoonful hits. And also in Atlantic City when Graham Nash DID walk off the stage while in concert with Crosby and Stills because nobody wanted to hear new music, they all wanted to hear the old stuff. I guess that's why I came! Watching the 1946 movie, "The Stranger" made me think of the connection between the makeup artist Robert Cowan and Davie Allan ... Robert Cowan is thegrandfather of guitarist Davie Allan. Davie is most famous for the song "Blues'Theme" from the Roger Corman film "The Wild Angels". Cowan never lived long enough to see his grandson become a composer and musician in the film industry. Davie formed the group The Arrows in 1964 shortly after Cowan's death. Cowan'sbrother, Hal King, was also a famous make-up artist. His sister, Rella, was married to Jack Factor of the famous make-up artist family. Well, I'm impressed, Davie. I've seen several of these films - The Stranger, Around the World in 80 Days, Easy Living, The Big Steal (a favourite), Western Union, Drums Along the Mohawk, Jessie James and I even have a couple of Jim Bowie episodes on a DVD. This means your grandfather worked for some top directors - Welles, Ford, Siegel etc. And Hal King must have done make-up for big stars too considering all those Lucy episodes. Thanks for commenting on the post about my grandfather.There are probably many uncredited films missing from the Internet MovieDatabase (IMDB) because he had told me about two of the latest ones on which hehad worked that are not included: Jerry Lewis' "The Ladies Man" (plus he gave methe good luck medallion that Jerry had given him that says "If you lose this, give up" on the back) and "Elvis' "Flaming Star". And "The Ladies Man" and "Flaming Star" are two great films that would have required a make-up artist's expertise, especially "The Ladies Man" with a cast filled with beautiful women. I think I would have liked being the make-up man on that one. Davie, did you hear any anecdotes about working with Elvis? My grandfather was the assistant makeup man on those two films BUT he DID get to work on all the ladies in Jerry's film and on all the Indians and bad white men in the Elvis flick. He did have nice things to say about Elvis but no great stories. About 10 years ago, I was in a local piano shop here in Portland, OR. I got to talking with a fellow behind the counter and mentioned my record collection and my 15 years in radio back in the 60's and 70's. He then said that maybe I'd heard of his dad, Voyle Gilmore. Of course I had. Cueing up all those Capitol hits back then, Voyle was a name that I had seen often. As V.P. of A&R for Capitol, he'd produced Frank Sinatra's hits from 1953-1958, the Kingston Trio's early successes, and even The Beatles Hollywood Bowl concert. John plays 'lounge piano' around the area, and I drop in to see him about once a week. He is a fantastic source of background info about the good days and shares stories with me all the time. One that he really is fond of is that Jimmy Page of 'Led Zepplin' fame was actually the session guitar lead for most of Herman's Hermits hits. In fact, that guitar intro for "Silhouettes" is a riff that Jimmy used as a warm up exercise, and when Mickey Most heard it, he built his arrangement for the recording around it. Thanks again for all your work, keep on truckin'! After much discussion back and forth between both Peter Noone and Vic Flick (both of whom are on our Forgotten Hits List ... and who even picked this topic up again when both musical legends were in Las Vegas), all parties concerned acknowledged FOR THE RECORD that it was Vic who played this famous lick, and NOT Jimmy Page as has been widely reported for years. (After our piece first ran, we issued a special "amendment" to the story which you'll see below.) In fact, if you do a bit of web searching now, you'll find Forgotten Hits credited on a number of sites as putting out the final word on this subject. PETER NOONE: The Hermits played on the songs that they played well on. Sometimes (sometimes) other musicians played on tracks, mostly because the band's weakness was our drummer (the nicest guy in the band and therefore irreplaceable) because he had pretty unusual time and was therefore un-overdubbable (my word) so we started using Clem Cattini (Tornadoes) and Jim Page (Yardbirds), John Paul Jones, Herbie Flowers and whoever was around at the time. Lek is the guitarist on For Your Love so you can see he was very good. Eric, I think, quit the Yardbirds because they had no work. You guys really need to understand the financial side of being a rock star in the '60s. I think the Yardbirds got 30 quid a night. FH: So, can you confirm then, once and for all, if JIMMY PAGE is the one who played the guitar riff on your original version of SILHOUETTES? PN: Jim played on Silhouettes and Wonderful World and, once Karl Green faded, he was replaced on ALL the recordings by John Paul Jones, who also arranged almost everything and was our genius. EDITOR'S NOTE: After this piece originally ran, it was brought to our attention that the on-going guitar riff that runs throughout HERMAN'S HERMITS' version of SILHOUETTES was actually performed by British Studio Guitar Whiz VIC FLICK. VIC and PETER BOTH confirmed this new piece of information in later editions of our FORGOTTEN HITS Newsletter. (At ONE point, there was even some speculation that VIC FLICK had SHOWN JIMMY PAGE the repetitive riff that runs throughout the song ... and then later it was debated as to whether or not PAGE was present at the recording session at all!!!) Certainly memories fade after 40+ years ... but the general consensus when all sides were presented is that it was VIC FLICK ... and NOT JIMMY PAGE ... who handled the guitar duties on the HERMAN'S HERMITS version of SILHOUETTES. PN: Jimmy Page only played on a couple of sessions ... Silhouettes and Wonderful World. John Paul Jones was the arranger and bass player on a load of stuff and even joined the band for one short German tour (The Hermits were afraid of him!) I can list all his arranged and played on songs when I am at home and can look at my memory. Peter Grant (ex-Herman's Hermits Tour Manager) was chatting about Led Zeppelin for ages before they broke and nobody who knew Peter or any of the Led Zeppelin guys doubted they would become huge. I remember hearing other singers being touted around who were signed to Mick Most and my only surprise was how long they stayed alive! Love your scrap book. Having played with The Rip Chords for almost ten years, I've worked with over a hundred of our heroes. But here is a picture from 1973, taken at a store called Alcasura in London. My band and I were there and we were buying some stage clothes. So was T. Rex. One thing led to another. Marc and Mickey and I took a photo together (that's me, right, at age 21). When they came to the U.S. in October, I was their guest (a new band called Aerosmith was the opening act - another story for another time). I went back with Marc and Mickey, drove them around Philly, then the three of us sat in Marc's room talking and jamming until his 5:00 AM lobby call to catch his plane. We eventually fell out of touch, and then Marc was tragically killed. I will tell you, he was a helluva good guy. Great shot ... and great memories! By the way, what Dr. Robert is referring to is our brand new "Scrapbook Memories" Page on The Forgotten Hits Web Page. Have you visited it yet?